These Vanilla Almond Balls are a perfect snack for those mid-day cravings. 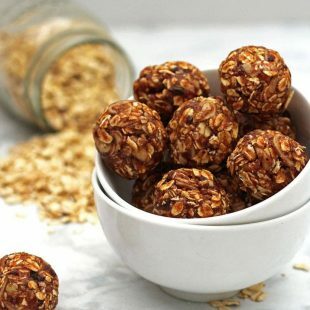 Although they're delicious, they contain no added sugar - only dates - so they're much healthier than most store-bought bars! Soak dates in very hot water for about 10 mins - reserve some of the liquid. Put the dates into a food processor and process until chopped and semi smooth. Add the date mixture and the rest of the ingredients to a bowl and mix together. Roll into about 1-inch balls. Place in freezer to set for about 10 minutes then store in the fridge for 7 days. *If it's too thick to process, add a tablespoon or 2 of the reserved date water at a time. You don't want it thin.